Josefine Larson Olin (SE), Igor Koruga (RS) and Juan Francisco Maldonado (MX) present a two day event and their performance All Dance leads to Wall Street with premiere Friday January 30. In relation to the second performance on Saturday January 31, Johan Forsman and Anders Paulin have been invited to mirror the project by sharing their upcoming work at Weld, Three White Soldiers, that shares the economy theme. The presentation is preceded by a brunch. Ticket is valid for admission to brunch and conversation. Dance and economy do the same thing. They both move in rather ungraspable ways, but they still affect us. They are equally abstract. But if one flips the coin, one can say that immaterial forces, a bit like air pressure, can push a door to move. So how can the immaterial force of dance affect the capitalist order of economy? It has been said that there is no alternative to capitalism, but we believe that to any existing rule(r) there must be one. If "Corporations are people" (Mitt Romney) and "Feelings are facts" (Yvonne Rainer), we say that feelings are banks, that tradings are pacts, or more importantly, that dance holds economical facts. That's why we invite you to come so that we collectively can explore and speculate about alternatives through the force of dance. We propose this while sitting with our computers’ logos covered by tape, posting advertisments on social medias, drinking Colombian coffee and at the same time being paid by the State of Sweden. Yet we are not cynical, and we are not giving up. Let's dance it off! 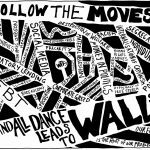 All dance leads to Wall Street is the first collaboration between Igor Koruga (SRB), Josefine Larson Olin (SE) and Juan Francisco Maldonado (MX). They decided to work together due to their common interest in dissecting contemporary canonised ideas on politics and economy through their different geographic and cultural perspectives, as well as from their different experiences in dance and choreography. Supported by The Swedish Arts Grant Committee (The International Dance Programme), The Swedish Arts Council and Weld. is a freelance artist working within contemporary dance and choreography. He graduated in MA studies in Anthropology at the University of Belgrade and in Solo/Dance/Authorship at Universitat der Kunste/HZT in Berlin. In his own artistic work, Igor is focused on applying choreography as an extended practice and tool for interpreting socio-cultural phenomena, citizen praxis and ideologies. As an active member of STATION service for contemporary dance (Belgrade), he collaborated with various organisations, theatres, cultural institutions, and participated in non-institutional educational platforms locally, regionally and internationally. He was a recipient of dance scholarships for educational programmes DanceWeb, Nomad Dance Academy and as well, a recipient of the dance scholarship by Berlin Senate. works as a dance artist and is based in Stockholm, Sweden. She did her dance education at Balettakademien, Stockholm and her master in new performative practices at the University College of Dance and Circus in Stockholm. She is interested in working with the potential of dance as an actor in society and in discourses. Josefine works in the broad spectrum of the performing arts field: sometimes as company dancer at Weld Company (Stockholm), as collaborator in the international dance collective Interferencias, but mostly as freelance dancer and actress in Sweden and internationally. has presented his choreographic work inside Mexico, Montevideo, Barcelona, Madrid and New York. In 2013, along with Colectivo AM he was commissioned an exhibition for the MUAC (Contemporary Art Museum of the University of Mexico). The resulting piece “Arrecife” dealt with the relationship between museum and dance through the notion of archive. He has written and edited two books collectively. He periodically writes critique for contemporary art magazines and is working on his first novel, so far entitled “Everything in the world is exactly the same”.